I’ve been thinking a lot lately about what this post should be about. My life has been turned upside-down over the past month: I’ve left my family, my home, my job behind and completely uprooted in a new city, with a new job and a new home. I’ve been dreaming about the day when I could finally write this post – the one where I’d tell you how amazing my life is now that I have my dream job. Ten minutes after I arrived in my new apartment, I slumped down on my air mattress and cried. I missed my home, my boyfriend, my dad and the comfort of the Maritimes. I asked myself what the hell I was doing here, in this dark basement apartment in Brampton, with no furniture or any semblance of home. I couldn’t believe I’d left my life behind in Fredericton for this. Three days later, I started my new job. I was sick to my stomach most of the morning, stressed out over whether or not I’m good enough to be an editor at a food magazine, and whether or not they’d even like me. My mom, who’d driven up to Ontario with me, left that morning before I got in my car to start my new job. I felt totally, completely, alone. To say my life is perfect now wouldn’t be entirely true. My boyfriend moved up a week after I got here. Ever since, I’ve been overcome with guilt for asking him to quit his job in Fredericton and come with me. He still hasn’t found a job, and is getting more and more frustrated every day. Money is tight, which is even tougher when you live in a city that demands a constant flow of cash. Our new apartment is a home, but it doesn’t feel like it yet. I’m homesick every day, and as much as I hate to admit it, I miss the understated simplicity of the East Coast. But as scary as this is, I know I’d never be able to forgive myself if I never gave it an honest shot. And, to be honest, I think I’m going to like it here. With the exception of its lack of garlic fingers (yes, Maritimers, there are no garlic fingers here), the food in this city is so much better, and the actual city itself is pretty breathtaking. This was my dream, and I owe it to myself to let go of all my inhibitions, fears and longings for home, and just be proud of what I’ve done. This recipe is adapted from Hamilton Beach. Place ice cream maker freezer bowl in freezer to chill the night before you plan on making sorbet. When ready to prepare, combine sugar and water in a saucepan and bring to a boil. Reduce heat to low and let simmer until sugar dissolves. Remove sugar water from heat and let chill in the refrigerator until chilled, about 1 hour. 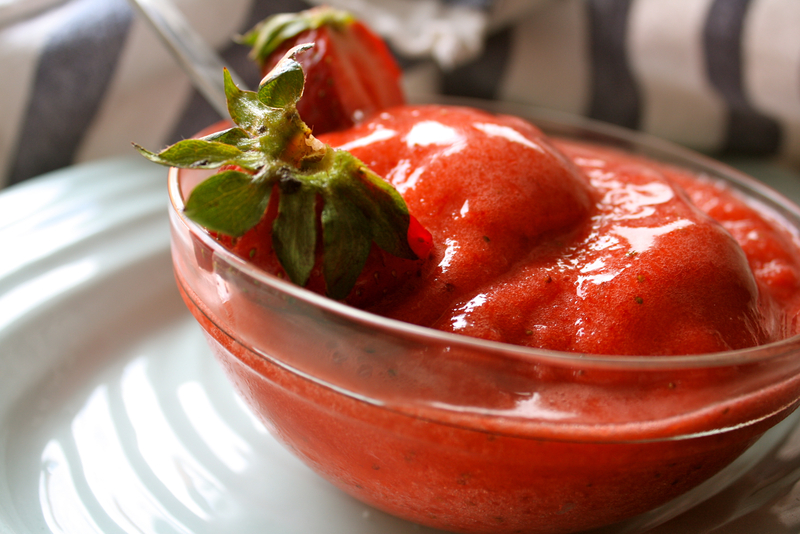 In a blender, purée strawberries, lemon juice and honey. Add sugar water and blend until just combined. Place freezer bowl in ice cream maker and turn the machine on. Pour strawberry mixture into the maker and let churn for 40 minutes, or until reached desired consistency. Serve immediately. Hi Gilean, so glad to have received your post. Just yesterday I was thinking of you and wondering how you were getting along in Toronto. Do your best to move forward and not look back. You will be a great editor at the food magazine. They are lucky to have you on board! As for your boyfriend, if he didn’t want to be there with you, he would not have made the move. Things will work out, just give it a chance. Hey, you may really grow to love life in the big city with all it has to offer. Just take things one step at a time, one day at a time. By the way, what magazine are you working for? Thanks so much Marlene! The magazine I work for is called Clean Eating. I think you can find it at the Indigo in PEI, or you can see the website at http://www.cleaneatingmag.com. I’m starting to settle in now, still a little homesick though. And I really miss the Island! Hopefully I can get back this summer!